Katachess is a chess training system to master chess! This program is not for players who do not know how to play chess, this program is for players who want to improve their game. The Katachess technique focuses on pattern recognition. The system gives you a series of ten puzzles which require the user to point ànd click the chess pieces to accomplish checkmate. If the user is stumped, he can click anywhere on the board and the pieces will move for him. I puzzle is considered missed if the player fails to make checkmate, the missed puzzles cycle around until all ten puzzles have been checkmated. After the user finishes the first ten, ten new puzzles appear and so forth ten more after that until the player has successful completed all the puzzles. Most chess students study famous chess games to remember the moves, but Katachess develops your mind for picking the best chess solution through pattern recognition! 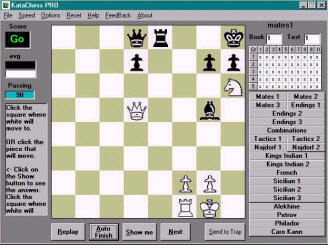 Grand Master Chess - A Chess Board Game, Computer Chess Game simulator is strong enough to keep you alert throughout the game.